1910/12/19 Letter from Harold Blossom to Roland C. Dixon can you dine with Frederick L Olmsted at the Colonial Club? 1911/02/21 Letter from Olmsted Brothers to Thomas O’Hallaran Marston, Coronado Nursery stock, Warner, Coronado Beach Co.
1911/04/01 Handwritten bill from M.A. Graham Mill Co. to Harold H. Blossom/ Olmsted Bros.
1911/04/13 Letter from James F. Dawson to Harold H. Blossom Miss Sessions palms, Seaforthia elegans, Washingtonias, E.H. Everett, Watsonias, Santa Barbara Nursery Co.
1911/06/29 Letter from John C. Olmsted to Frank P. Allen, Jr.
1911/09/06 Telegram from Harold H. Blossom to Olmsted Brothers Union publishes map of central site, Frank P. Allen, Jr.
1911/09/08 or later San Diego Agreement and Bill, including date of Olmsted resignation Agreement dated 10th January, 1911, with handwritten notes by JCO? indicating $700 or $750 remaining to be paid. 1911/09/27 Letter from Frederick Law Olmsted, Jr., to Bertram Goodhue still friends? 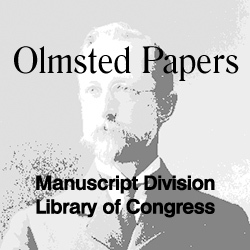 1911/10/19 Letter from Thomas O’Halloran to John C. Olmsted regret, Frank P. Allen, Jr.
1913/03/06 Letter from Frederick Gordon Lyle to Frederick Law Olmsted, Jr.
1915/04/30 Letter from Bertram G. Goodhue to John C. Olmsted re Architectural Record article, Frank P. Allen, Jr.
1915/05/17 Telegram from Bertram G. Goodhue to Frederick Law Olmsted, Jr. re Architectural Record article, Frank P. Allen, Jr.
1915/05/18 Letter from John C. Olmsted to Bertram G. Goodhue re Frank P. Allen, Jr.
1915/05/18 Letter from John C. Olmsted to Frederick Law Olmsted, Jr. re Goodhue’s Architectural Record article, Frank P. Allen, Jr.
1915/05/21 Letter from Bertram G. Goodhue to Frederick Law Olmsted, Jr. re Architectural Record article, Frank P. Allen, Jr.